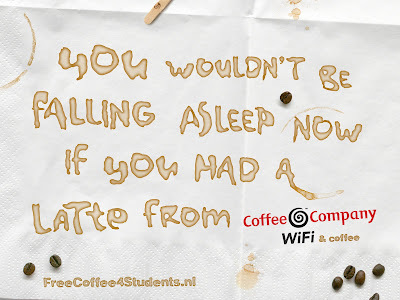 Coffee Company in the Netherlands are giving students the chance to monetise their Powerpoint presentations! Coffee Company are providing slides on their website for students to include in their Powerpoint decks. 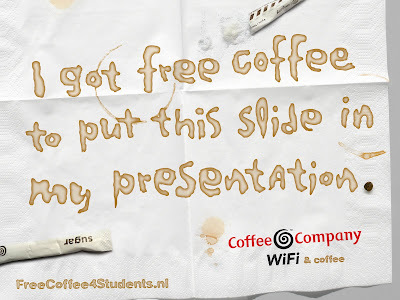 If photographic evidence of the slides inclusion is uploaded to the FreeCoffee4Students.nl website, then the presenter is rewarded with a coffeestrippenkaart worth 21 Euros. I have no idea if this will work or how many people have used the Coffee Company Powerpoint ads in their presentations - but I love this idea, it's cheeky and subversive and for me this is far more entertaining (though clearly not as scalable) as any number of Starbucks Twitter initiatives!